Sushi is all about mold. Not kidding. That’s the appetizing fact that Sang Kim shares with us as we get started at a sushi-making class. Despite my pathological fear of mold (stemming from an allergy to penicillin and a monsoon-like summer spent living in a basement apartment in Parkdale), there is no way I am going to be convinced to not love sushi – or miss this class. Can’t pass up on the opportunity to learn from Master Sushi Chef, Shin Aoyama, and Sang Kim, a genuine, charismatic man with a passion for good food and good people. 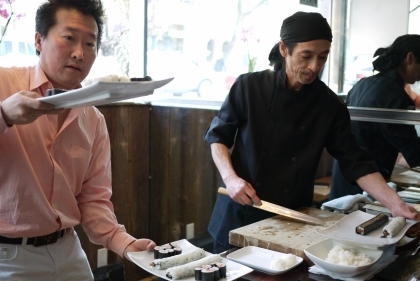 When it comes to the history of sushi, Sang knows his stuff. He gives us a fascinating talk on the why’s, where’s, and how’s behind sushi rice and nori, and how important they are to what we consider sushi today. Quality sushi is really all about the quality of the rice. (Freshest fish possible is a given. If you can’t provide that for your customers, just shut your doors.) And let’s not forget about the mold – it’s what makes sushi delicious. Better to ask Sang himself about the intricacies of this than for me to go into detail – as I spent most of my time trying not to think about that part and focus on making maki. I don’t exactly excel at work involving fine detail and sharp motor skills. Considering it takes about a decade to become a master sushi chef like Shin Aoyama, I’m resigned to the fact that I am going to produce some pretty ugly maki rolls. Though nigiri sushi is the original form of sushi, today we will focus on makimonos – which has become the go-to sushi of North Americans. Sang talks us through the details of the three types of maki rolls we will make– hosomaki (usually a single ingredient roll with nori on the outside), uramaki (the “inside-out roll” with nori on the inside and rice on the outside), and temaki (the cone-shaped hand rolls). Our hosomaki features salmon, our uramaki with spicy maguro tuna, and our temaki includes unagi and cucumber. Shin shows us how to make each roll twice, and his movements are subtle and effortlessly precise – each time creating a flawless product. After each demo, it’s time to get sticky and roll our own.